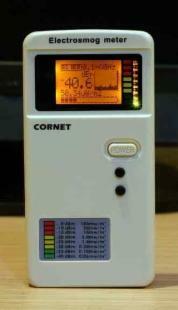 CORNET@ Affordable, Pocket size, High performance Electrosmog field strength power meter products ! 3G/4G phone, DECT, CDMA, mobile base station. and Sound signature function ! ED25G-RF/LF Electrosmog field strength power meter (100Mhz-3Ghz) with build-in LF Gauss meter function ! 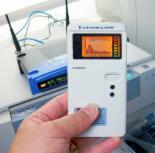 ED15SA -RF Electrosmog field strength power meter (100Mhz-3Ghz) with build-in 2.4GHz band Spectrum Analyzer! We are speciallized in high speed Communication, Network products development. Founded in 1996, as a product development house in Santa Clara, California USA. 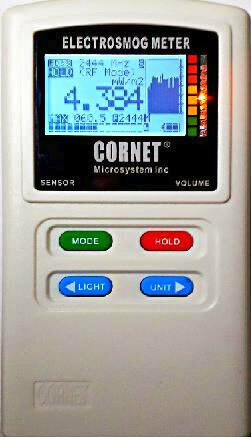 CORNET Microsystems develop, manufacture and market high performance products for communication, network applications. CORNET Microsystems speciallized in advanced system design and VLSI research development. with expertise in both system level and IC technology, CORNET Microsystems has developed several products in Network communication, Office automation and wireless communication applications.such as : 10/100 Fast Ethernet switch, Gigabit Ethernet Switch, Multi-mode switch for FTTB, Multi-port KVM switch controller, RF power-meter, Electrosmog detector/field strength meter, Spectrum analyzer, and wireless communication products.